Delicious pub grub? Check. Cozy red velvet seating? Check. A huge and impressive selection of wine, beer and spirits? Triple check. 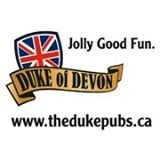 Welcome to the Duke of Devon, your friendly neighbourhood pub in the heart of Toronto’s Banking District.